There's more than lobster to enjoy in this small Maine metropolis. It’s no wonder why people love the peninsula formerly known as “Great Neck” — there’s history in Portland, but there’s also whimsy, waterfront beauty, and modern tweaks that make this metropolis seem both larger and smaller than it actually is. It’s hard to explain why Portland isn’t a more popular tourist destination, but once you visit you’ll understand why so many people are loathe to leave. You’ve got 48 hours. Prepare to appreciate this cultural hotbed in record time. From its colorful façade to the brick-clad walls and lacey linens inside, the Inn at St. John is charm incarnate. This B&B includes a continental breakfast, but it’s the 39 diverse guest rooms and warm hospitality that gives this century-old establishment it’s warmth. The Hyatt Place Portland-Old Port is a chain hotel with local flare. Spacious accommodations come with modern amenities sweeping views of the waterfront, while green-certified conveniences like electric car charging stations appeal to eco-minded travelers. Location is also a major perk; stay here and you have easy access to some of the best spots in Portland. 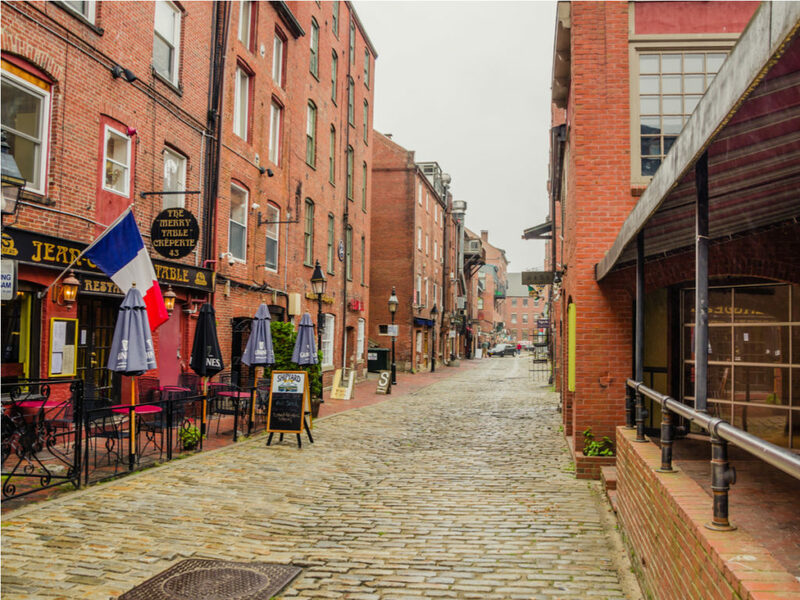 A cobblestone street in the Old Port District. For those with bigger budgets and a penchant for history, there’s the Portland Harbor Hotel in the city’s Old Port District. While the hotel itself has only been around since 2002, the subtly nautical décor and subtle touches like a spiral staircase and ornate bead-and-pearl molding add a distinctly classic feel. Kick back by the outdoor fire pit, borrow a complimentary bicycle, or cozy up in the luxuriously appointed rooms. 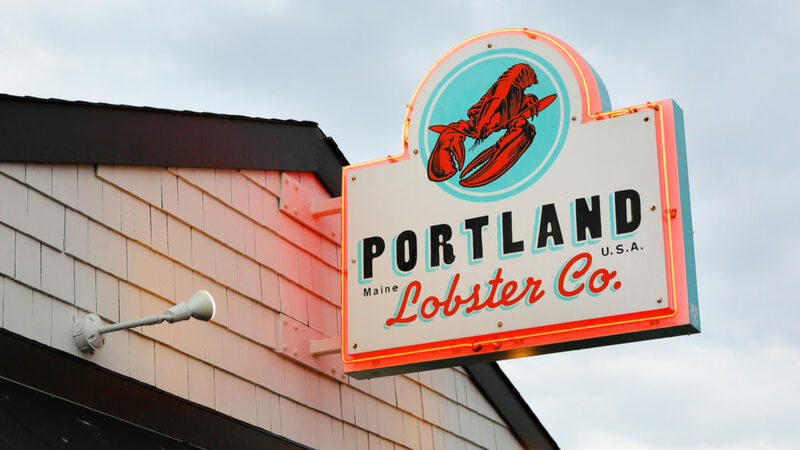 Maine is lobster central, so dig into the buttery-soaked goodness as quickly as you can with a lobster roll or full dinner at Portland Lobster Company. There’s also Dimillo’s on the Water, a restaurant that used to be a car ferry but now serves everything from savory lobster stew to creamy, lobster-studded mac & cheese. No trip to Maine is complete without a lobster roll. For casual eats, the Portland Public Market House is hard to beat. Two floors of food stalls encompass everything from gourmet ice cream to Middle Eastern snacks. Portland’s foodie culture has also led to a slew of successful food trucks; Cousin’s Maine Lobster started here before expanding across the country thanks to an appearance on Shark Tank, and the fresh eats from Farm to Coast Mobile Kitchen are worth tracking down. There are tons of bars in Portland and it’s impossible to explore them all, but you can put a major dent in your to-drink list if you hit up a brewery tour. There are tons of bars in Portland and it’s impossible to explore them all, but you can put a major dent in your to-drink list if you hit up a brewery tour. Summerfeet Cycling takes herds of pedaling tourists to some 25 craft breweries, or you can rest your legs and board the Maine Brew Bus instead. For more highbrow drinks, head to Vena’s Fizz House, a restaurant and bar that also sells DIY liquor infusion kits and glassware curated by co-owner Johanna Corman. As the name suggests, Portland is a city built around water-based business, so it’s no surprise that the Portland Waterfront Historic District, or Old Port as the locals call it, is so popular. From the cobblestone streets to much of the well-preserved architecture, the district’s age and history are on full display. 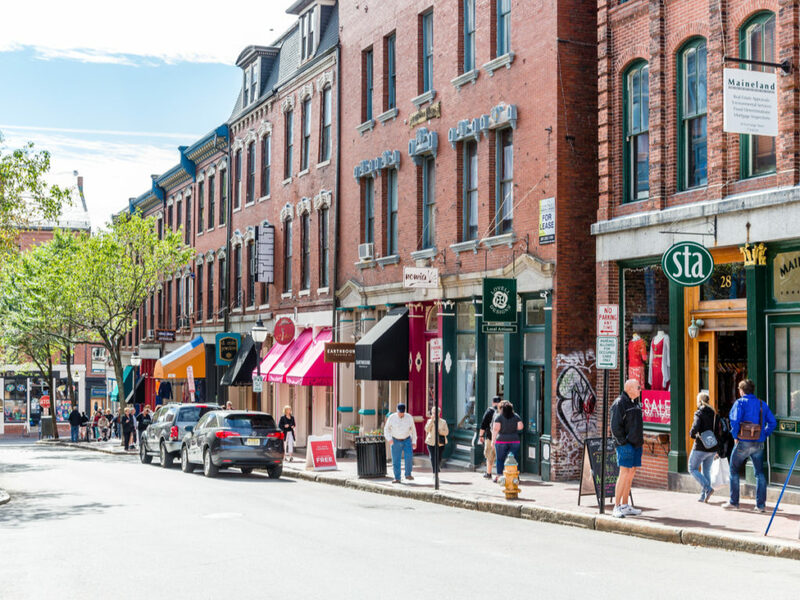 Wander past buildings constructed in the mid-19th century, visit a few locally owned boutiques, spend time at the Portland Museum of Art or the State Theatre, or go in June and immerse yourself in family-friendly fun at the Old Port Festival. Classic Maine photo op at the Head Lighthouse. Old homes are plentiful in Portland, but one stands head and shoulders – or is it gables and spindles? – above the rest. Victoria Mansion was built in the late 1850s as a summer home for New Orleans hotelier Ruggles Sylvester Morse and his wife. The mansion still contains more than 90% of the original interiors, including gilded trim, ornate tapestries, opulent plasterwork, and deceptive wall paintings by Giuseppe Guidicini that make certain surfaces appear 3D. You can’t visit Portland without getting out on the water, and a trip to the Casco Bay Islands is the perfect way to soak in Maine’s extensive natural allure. 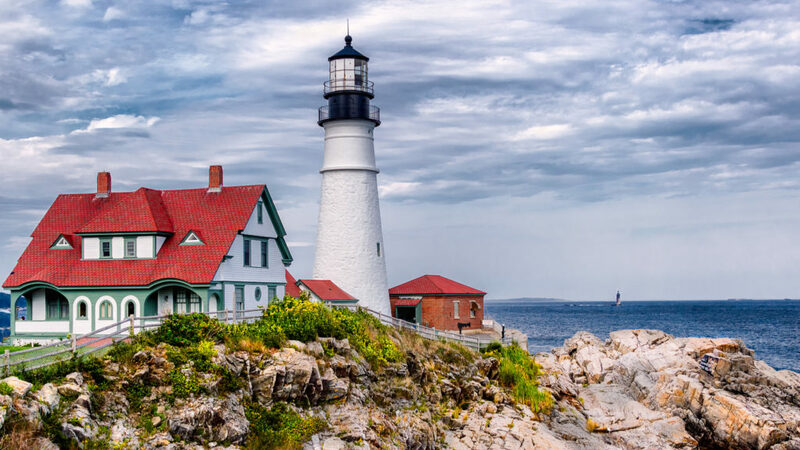 You can’t visit Portland without getting out on the water, and a trip to the Casco Bay Islands is the perfect way to soak in Maine’s extensive natural allure. You’ll need to hop on a ferry, but it’s just a short jaunt over to Cliff Island, a tiny atoll with just 60 residents, or Great Diamond, a rocky, forested expanse with a few beaches for good measure. Peaks Island is just a 17-minute ferry ride, and once there you can snag a golf cart and putter around the artsy community or check out the local military history at the Fifth Maine Museum. Visit Portland Trading Co. for quality men’s and women’s clothes mixed in with quirky home goods and personal items like beard balm. At Found, it’s all about vintage odds and ends and one-of-a-kind gifts. Weekends in Portland bring the Portland Flea-For-All, a gathering of 50-some vendors selling everything from antiques to handmade jewelry to vintage clothes and records. In the market for the best in menswear? David Wood Clothiers and Haberdashery is where Maine’s stylish men go when they need to get kitted out from head to toe. Enjoy shopping in Portland's waterfront area. The Best Way to Travel: It’s just two hours from Boston to Portland on the I-95, or you can take any of the major commercial airlines into Portland International Jetport. Amtrak also runs through Maine, and both local and national bus lines offer regular service. Lastly, Portland’s waterfront provides a welcome spot for cruise ships to dock and let off passengers traveling from the lower US up to cooler spots like Nova Scotia. When to Go: It gets awfully chilly up north between late fall and early spring, so unless you feel like packing a parka, your best bet is to book your trip to Portland between June and August. If high season sounds a bit too crowded, opt for still-temperate times in late spring or early fall. How to Get Around: You can rent a car at the airport or via several lots around Portland, but public transportation and bike culture are both strong here as well. Grab a ride on a METRO bus, cycle from place to place, or just walk. Plan To: Take things slowly. The downtown area’s close-knit shops and restaurants in particular beg for window shopping and other forms of unhurried exploration. Here’s a Hint: Before you explore, pack a picnic lunch full of goodies from Aurora Provisions. Local ingredients and simple combinations make for irresistibly good eats that also happen to be highly portable.